Whenever I’m asked whether it was hard for me to give away my much-viewed painted vinyl sofas, the answer’s always an emphatic no. I mean, if I hadn’t they wouldn’t be looking awesome at their new home on Britney and Bill’s hilltop aerie in Riverside. Husband Bill designed the deck, and he and other family members constructed it; it’s an impressive raised platform that may yet become a tea house. It’s fun to get to, involving a nice set of steps up from their backyard, followed by a steep path. 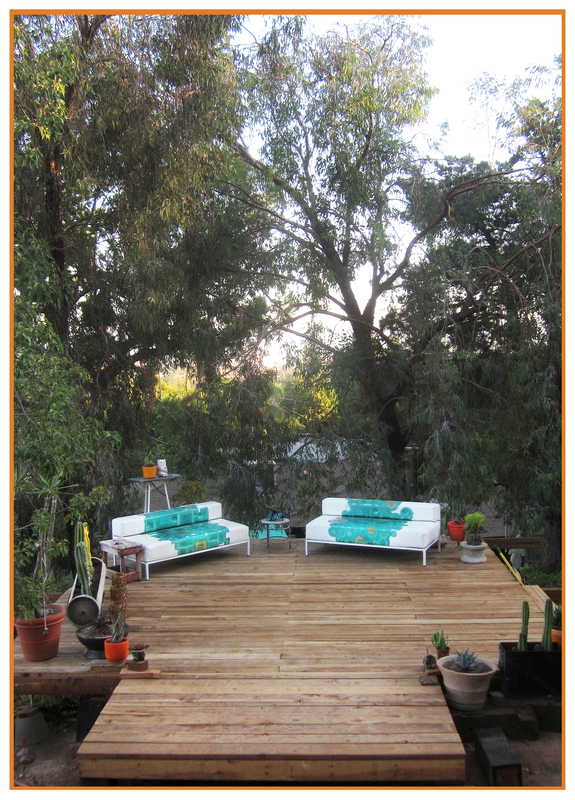 Being on B&B’s deck you feel like you’re in a very special outdoor room — up in the trees and above it all. Signs that Britney’s been flexing her design muscles are all around the property and it’s no different on the deck; she’s constantly adding to her collection of vintage planters and other finds … Bonus: Britney snagged quite a few prized objects from the Rancho’s sales last year so I get to visit them as well as the sofas. When the sofas were at the Rancho (see inset) they always got a lot of attention, both online and in-person. Do I miss them now that they’re gone? Not really; I’m an out-of-sight-out-of-mind kinda guy. Besides, I’ve been sitting on them as the sun was going down, with the sound of the breeze in the surrounding trees and a glass of wine glowing in my hand, so I know they’re in a really good place! Gosh, they look fabulous in their new home!!! What a great photo Reuben! 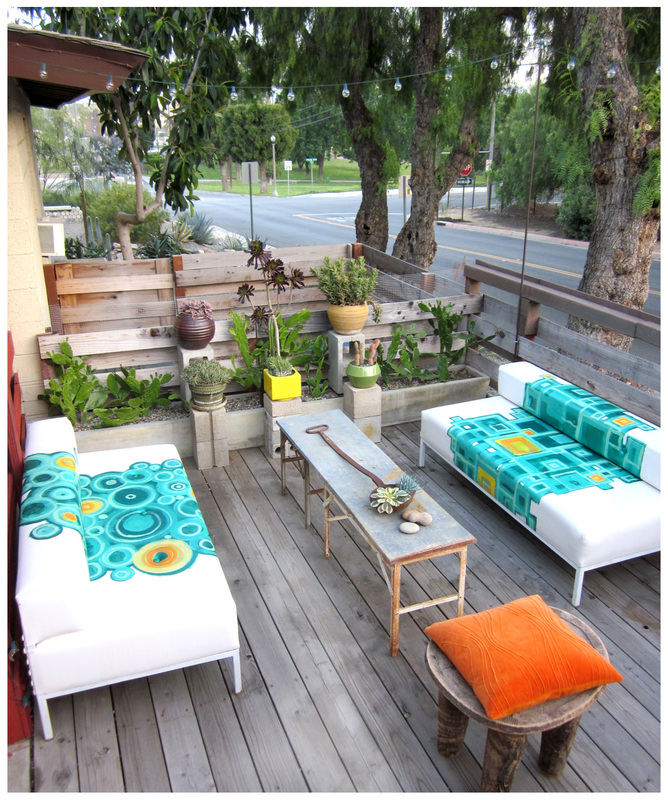 I loved the sofas at your house, but when the deck was built, I could only envision them at my house, and they are perfect. What’s even better is when I have good friends like you and Paul over for some good wine and great conversations on the deck. Hopefully the next time you’re over (which will be soon) there’s a breeze so you can hear the bells and chimes. Hi Reuben, thanks for visiting my blog, I was hoping to see your orange posted here tonight but I will check back. I can’t wait to see all of them on the 1st and at the Gala. How do I know you? Have we met? Sorry if I don’t recognize your name. We are practically neighbors. I love your work, very cool. I have a small succulent house, where the roof is all succulents. you would probably love it! Hi, Desiree, I came across your blog while searching for something orange-related… My own finished orange post is coming right up. I don’t know if we’ve met but we might have … I find that happens here in small town Riverside … same thing with being neighbors. I’d love to come by and see your succulent house, we’ll have to find a way to meet up. See you soon and thanks for commenting!